Although the Turkish Parliament is frequently the scene of rowdy discussion, it’s not often that a lawmaker leaves with a bloody nose. But these are not ordinary times in Turkey. On February 15, in a debate on a bill that would increase the government’s authority over the judiciary, an opposition speaker called Prime Minister Recep Tayyip Erdogan a “dictator” who wants to “control the entire system.” In response, members of Erdogan’s Justice and Development Party (AKP) asked the speaker, “Are you drunk?” and rushed the podium. A video of the brawl that circulated on the Internet shows a blurry knot of dark suits, lawmakers in a group tantrum. Republican People’s Party (CHP) representative Ali Ihsan Kokturk emerged with a broken nose. The bill passed. The fight marked another day in a tumultuous nine months. Last May, a sit-in to save Istanbul’s Gezi Park blossomed into nationwide protests characterized by the stunning brutality of riot police. Five people died, dozens lost eyes to plastic bullets—and for the first time in eleven years, Erdogan’s grip on Turkey seemed to be faltering. Then, in December, an investigation into corruption among government officials went public with an early-morning raid that uncovered shoeboxes full of cash and led to the arrests of prominent businessmen and sons of cabinet ministers. The highlight of the investigation so far has been leaked phone calls allegedly between Erdogan and his son, Bilal, that seemed to catch Erdogan red-handed. “There is your money in the safe,” Bilal appeared to remind his father. Erdogan went into battle. Just as he had during Gezi, he blamed outside forces for the corruption probe. This time, the accusation focused on a Pennsylvania-based Islamic cleric named Fethullah Gulen, who Erdogan said enlisted his vast network of followers to conspire in a “judicial coup.” Erdogan purged the Turkish police and judiciary of people perceived to be “Gulenists” and fired cabinet ministers, replacing them with officials prized for their loyalty. His party introduced a bill to control the Internet, where information on the investigation found new life, and tightened its grip on the mainstream media, which in turn defended Erdogan’s claims, when they reported the scandal at all. He spoke in no uncertain terms: “History will not forgive those who have become mixed up in this game,” he said in a New Year’s address. “Whichever party you support, this plot targets all of you without exception, the bread on your table, the money in your pocket, the sweat of your brow.” When Bilal was first named in the investigation, Erdogan assured the Turkish public that if his son turned out to be guilty, he would disown him. He insisted the leaked conversations were fakes and, for good measure, an invasion of privacy. Erdogan is adept at counterattacks, but the past nine months have carried unprecedented threats. “[Erdogan’s] enemies are also resourceful and will not refrain from using what options they have as this war of attrition deepens,” wrote journalist Semih Idiz on the news site Al-Monitor. The leaked phone calls likely represent a fraction of these “resources.” But while this tactic revealed flaws in Erdogan’s leadership with all the subtlety of a fireworks display, it also showed the limitations of his challengers. With local elections scheduled for the end of March, and the coveted Istanbul mayoral seat in the balance, the focus shifted from what was wrong with the AKP to what was wrong with the Turkish opposition. When Erdogan helped to establish th AKP in 2001, the country was changing. Religious Turks, long forced to suppress their beliefs in a rigidly secular state, had become upwardly mobile and more visible. Islamist political parties had also been gaining ground, but were regularly banned by the courts or the military. The AKP chose not to define itself along religious lines—Erdogan, especially, rejected the term “Islamist”—but its politicians wore their Muslim identities proudly. This balance between piety and modernity appealed to both religious and secular Turks, and Erdogan became a magnet for votes. He came from a hardscrabble, working-class background and attended an Islamic school, not an elite private one. Instead of denying his past, he broadcast his hardships. Erdogan’s people were Turks with modest backgrounds and poor connections but new ambitions. They felt unrepresented in government, and they looked like, and looked at the world like, Recep Tayyip Erdogan. “A lot of people think Anatolian voters are irrational,” H. Akin Unver, a professor of international relations at Istanbul’s Kadir Has University, told me. “I think they are overly rational. They don’t vote for secondary matters. You have to change their everyday lives.” After becoming prime minister in 2003, Erdogan rolled back restrictions on head scarves, built roads and reached out to isolated groups. He understood the trauma Turks felt in the aftermath of the 1980 coup, when whole villages were uprooted. “Erdogan animates that anger,” Unver said. The AKP also focused on the campaign for accession into the European Union, building a strong economy and challenging a too-powerful military. The party won three consecutive elections but entered a landscape virtually devoid of strong opposition voices. After the 1980 coup, the military had terrorized Turkey in an attempt to eliminate dissent, essentially wiping out the left. A strong Kurdish opposition concentrated itself in the armed Kurdistan Workers’ Party (PKK), which launched an insurgency against the state that has raged throughout the AKP’s tenure. But the Kurdish opposition was marginalized by its nationalism, and it periodically supported the AKP. Secular Turks, including members of the CHP, got used to second place. 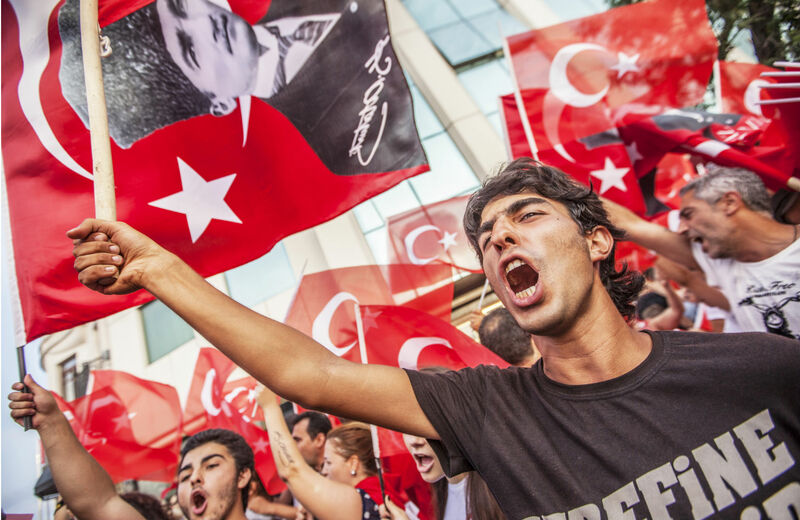 In power, the AKP passed some liberal reforms, but it also further chipped away at the opposition, imprisoning journalists, Kurdish activists and secular Turks for supposed links to terrorism or coup attempts. The crackdown on the Gezi protests displayed little tolerance for dissent, even from a prime minister who was once imprisoned for reciting a poem. And the list of threats grew to include Fethullah Gulen and the Gulen movement—alternately referred to as the hizmet (service) or the cemaat (community)—which had once aligned with the AKP in its attempts to root out threats to its authority. Fatih College is housed in an imposing building that more closely resembles the municipal offices of a small, wealthy city than a school. Excavations for future developments pockmark neighboring fields, and low-flying airplanes make the air hum. Kemal Pehlivan, vice general manager of the school, buzzed us through a maze of doors leading to halls and classrooms so clean, so well appointed and so full of smiling children as to seem slightly otherworldly. Science labs that looked like catalog photos were proudly described to me as “fully loaded.” Large color posters celebrated award-winning projects. Last year, a Fatih student discovered that you could increase the omega-3 content in certain fish by adding purslane to their food. “Thirty years ago, people had problems with the education in Turkey,” Pehlivan said. “We want our children to get a better education and to be better people. Fethullah Gulen advised us to open schools.” Gulen schools have opened in 110 countries, with some 140 charter schools in the United States. Gulenists travel far outside Turkey to teach in the schools, work often regarded as service in gratitude for a subsidized education. They consider themselves ambassadors of Turkey and their faith, participants in what Joshua Hendrick, a sociologist at Loyola University in Maryland and the author of Gülen: The Ambiguous Politics of Market Islam in Turkey and the World, calls “the battle of ideas for who speaks for Islam.” At Fatih College, a decal affixed to nearly every classroom door in the elementary wing reads Fatih College: Represents Turkey to the World. Gulenists argue that their prominence in Turkey is the result of education and ambition, their numbers owing to the wide appeal of Gulen’s message. Figures like Gulen, who took out an ad in The Washington Post condemning the September 11 attacks the very next day, are sorely needed in the Islamic community, they argue. Pehlivan employed a commonly used term to describe Gulen-educated Turks: “This is the golden generation,” he said. Gulenists are accused of courting Turkey’s promising students and grooming them to excel on behalf of the movement, cementing their loyalty with scholarships and a religious education. Members are encouraged to donate money each month—a common religious practice, but this accumulation of funds raises suspicion. Critics also say that Gulenists aspire to positions within Turkey’s police and judiciary, where they can wield decisive influence over the future of the country (and also control outsiders) without taking the risk of forming a political party. When Erdogan called the movement a “parallel state” launching a coup, he was one-upping those critics. He was also contradicting himself. The AKP and the Gulen movement come from different traditions of Islamic politics, but for years they worked together, increasing Turkey’s influence abroad and garnering votes at home. They challenged the powerful Turkish military, targeting coup leaders, but became overzealous; the court cases, known as “Sledgehammer” and “Ergenekon” (and named after the coup plots), are now behemoths threatening all dissenters. Gulen criticized Erdogan for turning away from the EU; for condemning Israel after the 2010 Mavi Marmara incident; and for negotiating with Turkey’s Kurdish minority. In 2011, Erdogan began trying to wrest control of the judiciary from the Gulenists, marking the start of a feud that boiled over this past December. “It is not something I find tremendously surprising,” Hendrick said. “It has always been a coalition of mutual interests, not an equal partnership of shared identities. After the tour of Fatih College, we ate lunch in the faculty dining hall, sitting on plush chairs that would not have been out of place at a wedding reception. A waiter served us pasta, and Pehlivan’s young son came in, kicking a soccer ball. Energized by the meal, Ceran was less cautious than earlier, when he spoke mostly to underline the goodness of the movement. “Our lack of transparency is a lack of PR,” he said. “We did not focus on telling people who we were, because we were confident that we were doing good stuff. But if you don’t define yourself, someone else will define you.” He was bitterly angry at Erdogan. “The prime minister is humiliating us,” he said, and he didn’t understand why. The AKP, he insisted, in the dining hall and again during the car ride home, was so much more powerful. A few heroes emerged out of last summer’s Gezi demonstrations. Among them was a film director and politician named Sirri Sureyya Onder, who famously stood in front of a bulldozer headed for the park. He became a symbol of the protests, and when he announced his candidacy for mayor of Istanbul, Hurriyet Daily News wrote that it “appears likely to be one of the most hotly contested races in years.” Erdogan was mayor before he became prime minister, and the future of the city was at the heart of the Gezi protests: losing Istanbul would signal a drastically weakened AKP. Late last year, Onder joined the new pro-Kurdish Peoples’ Democratic Party (HDP), intending to challenge “Turkey’s nationalist mentality and the AKP’s conservative nationalist regime,” he wrote to me in an e-mail. As a leftist, Onder was best represented by the Kurdish party, but he was also caged there. Turkey’s more pragmatic opposition voters would be forced to turn to the CHP, the party established by Mustafa Kemal Ataturk nearly ninety years ago. The CHP emphasizes Kemalist values like secularism and a unified Turkey, and it has survived disbandment following the 1980 coup, accusations of links to the “deep state” and decades of internal upheaval. It has the second-highest number of seats in Parliament, the support of liberal voters with few options and now, maybe, a chance at more. Erdogan’s bad year was a gift that the CHP was eager to unwrap. Onder’s rally seemed like a funeral compared to the day I spent with Mustafa Sarigul, the CHP candidate for Istanbul mayor. A bus with Sarigul’s face emblazoned on the side took the candidate, some colleagues and a group of corralled journalists from Sisli, where he is currently mayor, to Atasehir, a historically working-class neighborhood in the throes of gentrification. Supporters wearing bright-yellow scarves (sarigul means “yellow rose” in Turkish) ran next to the bus, reaching toward the open window where Sarigul stretched out his hands. He banged his palms hard against the windshield, as if to shatter the glass in a show of strength. Sarigul was once expelled from the CHP because of corruption, and critics liken him to his AKP counterparts; but the party, in second place behind a wounded AKP, welcomed him back as its best chance of winning the mayor’s race. Compared with Onder and Erdogan, Sarigul seems the most like a politician—kissing babies, avoiding tough subjects and awarding constituents with weekend getaways. He employs religious language while appealing to the CHP’s secular base. His charisma functions like a blinking sign reminding people that the CHP is open for business. The Gezi Party may eventually develop into a force, but in early 2014 it is a collection of ideals packaged under a brand, and that brand is losing its punch. It’s hard to know what “Gezi” means now. Demonstrations faded by late summer, and Taksim was back to normal seemingly overnight. On ritzy streets, wealthy Turks buy heavily taxed Levi’s and tourists ride a slow cable car up Istiklal Avenue. On some nights there are violent protests, but by morning they amount to little more than overtime for sanitation workers. Gezi altered the way countless individual Turks relate to their government, but the protests were too diverse, too unpredictable and too fleeting to become a unified opposition. In response, the AKP has worked to make protesting more dangerous. Thirty-six Gezi demonstrators have been charged with terrorism. In February, the AKP deported a foreign journalist for two offensive tweets. A law was passed that criminalizes informal medical care (i.e., treating injured protesters), and Turkey nearly doubled its annual order of tear gas. Sporadic demonstrations carry grave risks. A Turkish TV journalist reporting live from a recent protest was hit by a water cannon; an image of her flying above the ground, still clutching the microphone, went viral. It resembled a photo that had sparked the original protests in May, of a policeman shooting pepper spray inches from a woman’s face, except in the new photo the reddish spray is much bigger and the protests in response much smaller.